A flyer posted by the Oakland Fire Department on the front of the Laney Student Center lists fire watch protocol. Laney College has been on fire watch since Jan. 22, and it has cost the Peralta Community College District over $80,000 in collateral fees. “I’m not going to name names as to who dropped the ball here,” said Vice Chancellor Sadiq Ikharo after he was asked to disclose who deserved the blame during the Feb. 26 Peralta Board of Trustee Meeting. Following a routine safety inspection on January 10–11, the Oakland Fire Department cited “critical deficiencies” with the alarm panels in all Laney buildings, and placed the campus on costly fire watch, which requires every building to be checked every hour of every day. 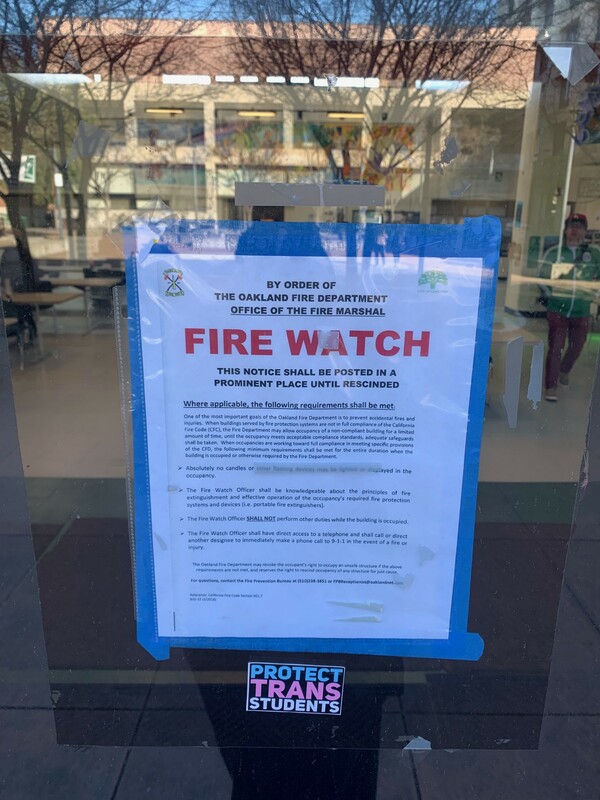 According to Laney College President Tammeil Gilkerson, who presented the fire department report to the board, fire watch services cost just under $12,000 a week, and set the district back over $63,000 from Jan. 22 to March 1. The first person at the meeting to question the necessity of fire watch was Trustee Meredith Brown, who said the costs of replacing the alarm panels should have been covered under a previous June 2017 contract with Tyco Simplex Grinnell. Board meeting documents from February 2019 state that Simplex Grinnell, now owned by Johnson Controls, had been granted a $198,321 contract to perform the “necessary maintenance and repairs to the existing fire alarm systems at all Peralta Facilities,” before contract termination in June 2019. The confusion caused a flurry of back-and-forth questioning between Ikharo and other board members during the Feb. 26 open session of the board meeting. “We’ve paid for them to fix what should still be covered within a contract that doesn’t terminate until June that we did fund, according to my paperwork here, so I am befuddled,” said Trustee Cynthia Napoli Abella Reiss. Ikharo responded that last year the Board approved a renewal of the Johnson Controls contract for $492,610 until 2021, but it was not funded quickly enough for the purchase order to be generated for the vendor. “The need of facilities to be able to get sufficient funding to get this done has been problematic given the budget constraint that we operate under,” Ikharo said. The problem first came to his attention in December 2018, Ikharo said, when one of the engineers at the meeting of the PCCD Facility Committee suggested that fire watch could become an issue. At that point, the vendor declared that it was unable to complete the repairs in January because the company had already drawn out its schedule for the month. “Unfortunately for the district, the Oakland Fire Marshall sent two individuals by Jan. 9 and 10 to come and do an audit investigation,” said Ikharo. According to Gilkerson’s account of the Oakland Fire Department report, even after the basic panel repairs are complete and the campus is removed from fire watch, there are still “several other important deficiencies that will need to be addressed in very short order,” including replacement fire hoses, a follow-up inspection report, annual sprinkler testing, emergency light testing documentation and dry standpipe certification. “My reaction at the last board meeting one of was surprise and disappointment, because specific steps were taken to avoid the current circumstance,” Brown said. The Board had hoped to be off fire watch by the end of the first week of March, but the situation has dragged on with no resolution in sight.